I was definitely freaked out by I Hunt Killers, so when my friend Amy wrote me, "OMG. Have you read the sequel?" I hopped on my kindle. 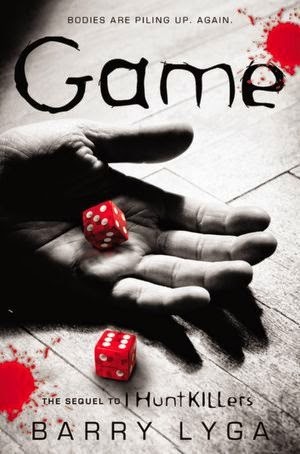 Game, Barry Lyga's second novel in the series, was even better than the first. The stakes are higher for Jasper Dent now that his father has escaped from jail and is on the loose in New York City. Now that their twisted relationship has been established and the reader is comfortable in Jasper's mind, the author has been set loose, too. The information on serial killers has been meticulously researched, and is used to keep the reader guessing. I love when I am fooled into a suspecting someone falsely, and Lyga pulls this off multiple times in Game. This book is seriously creepy, and I'm not sure why I decided to read it the week that I am home alone. It had me double checking the locks before going to bed and freaking out when the wind slammed a door shut in my house. Bravo, Mr. Lyga. A new addition is chapters from the perspective of Jasper's best friend, girlfriend (love that Connie), and father. It kept the story moving and gave me more insight into why people would get mixed up with someone who has so much baggage. I hope this continues into the next novel. Considering that Game was just released a month ago, it will be awhile before I find that out. Hurry up, time, and pass!